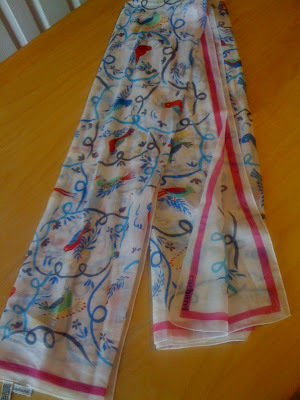 This is my Cacharel scarf that I bought yesterday-it is so pretty, with pictures of birds all over it-very summery!! This red cinch belt was only £2 from Primark, when I went shopping on Monday. 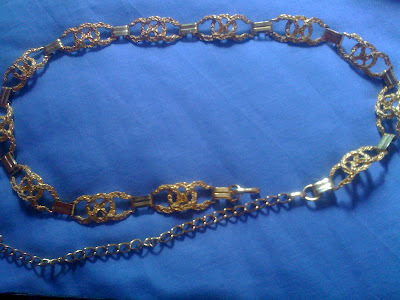 This black leather one was £3.50, which has gold horsebit details along it-this was the belt I bought yesterday! Really like the scarf. Good find. Hi Wendy-thanks so much-it's ideal for a different summery look! hi makeupbyrenren-thanks so much, I will stop by you too!! I always find that adding a scarf makes a simple outfit more elegant and fun :) well done. Oh scarf is so cute! I love the sunny pic! Love that skarf on you, perfect for summer! That red belt is great, perfect to wear over cardigans for fall. Great bargains. Check out my latest 70s post, when you have the time. Hi fashion chalet-yes, it felt more dressy wearing a scarf-thanks!! Hi Acielle-thanks very much my dear!! Hi Silje-Thanks for your lovely comment and I'm coming right over-haha!! cool pattern on the scarf! Thats so funny! I truly believe we have a sort of sixth sense going on. How else could we explain how we think about the same things over and over again?? Oh and I got my ebay finds in the mail today and they were sooo good! I know you understand how excited I am, you live for great bargains yourself. Hopefully I can were one of the dresses for drinks tomorrow! i'm so with you on scarves, but my belt collection is shamefully sad! the cacharel is such a find, beautiful. that red belt is super cute and looks as though it would be really flattering. What fabulous purchases. You have a great eye! dont forget to check out my contest!! Very very lovely colorful scarf. Work it girl. Lovely scarf! I like your accesories too. Hi arielle-yes, it is cute-thanks!! Hi silje-yes, I reckon we have too!! This has happened a few times now-LOL!! Yes, I look forward to seeing your newest bargains Silje, they're sure to be stunning!! Hi fashion herald-thank you! I must admit, I should wear my belts more often, I do have some lovely ones, but just don't wear them!! Hi cupcakes and cashmere-thanks!! I will do a photo when I get round to wearing it! Hi asian cajuns-thanks girls, always so lovely! Hi steelcloset-thanks for your lovely comment and for stopping by too! Hi nay'chelle-thanks a lot my dear!! Your accessories are so hot ))) love the scarf! 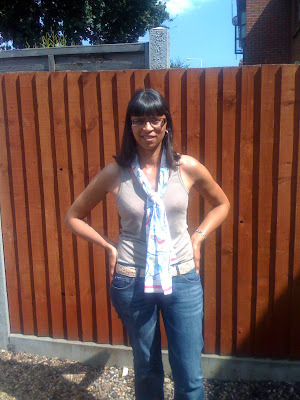 Great scarf - lots of fab posts to catch up. What a great time you had with Wendy B! Hi Kate-thanks so much, yes that day was so memorable, really good!! The belts are AMAZING, I love each one. oh Ilove that scarf and the first belt is great! 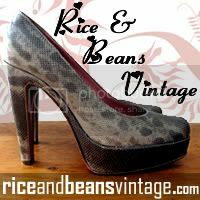 Hi rice and beans vintage clothing-thanks so much, always so kind!! Hi lara-thanks for stopping by and for your comment too! love the scarf of course - beautiful pattern! and the red belt - well done, again! So pretty. I love the scarf. You definitely know how to make it work, too. Great post! Hi ellie-thanks so much and of course, you're welcome!! Sharon, you are way too chic -- that bird scarf has my name written all over it and the belts are divine as well. Hi always in style-what a lovely comment, thanks so much, my dearest!! I love that red belt.Definately my favorite. Hi mimi-thanks very much and thanks for stopping by too!